I’ve made this one for my friend’s granddaughter. Nita passed away last September and she was so proud of her first grandchild and absolutely adored her. When I came across this small heart backing in my cupboard, I immediately decided to make something for Poppet. I loved her Grandma dearly and we had a bond going back over 30 years, so I hope it will be something special for her. For my sight impaired readers, I’ve used dusky pink round gems around the border. In the middle of the heart I have a flowers made with two shades of green ceramic petals with a hot pink glitter dot in the centre. I have a small reddish pinwheel in the top left of the heart, and two hot pink dots in the top right. 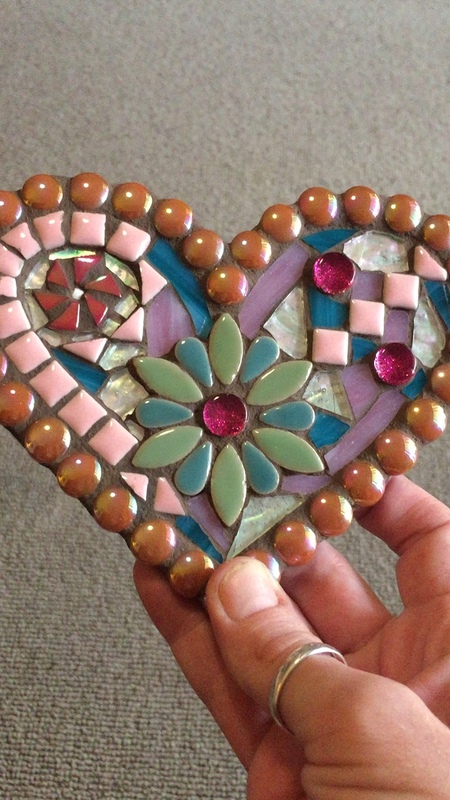 Pale pink tiles make a pattern through the heart and along one border, and I’ve used pink, blue, and white stained glass to fill the background. The white stained glass tiles shimmer iridescent in the light, I really like using it. The colour grout I’ve used is cinnamon. That’s so pretty. I am sure she will be delighted with it. Do you buy the petals precut or shape them yourself? Thank you, I hope so too. I made one for her big sis about to post about now. In the heart I’ve used precut ceramic petals, but in the other one I had a go at cutting petals. The little ones are a bit rough, they were harder to do just because I cut them from 1cm tiles.